Film and Television appearances include: The Producers, The Dave Chappell Show, PBS’ Dance in America, Fosse, Good Morning America and The Macy’s Thanksgiving Day Parade. Tours and regional productions include: Oklahoma!, A Chorus Line, Chicago, Cabaret, West Side Story, 42nd Street, Phantom, and the legendary Radio City Music Hall Christmas Spectacular. 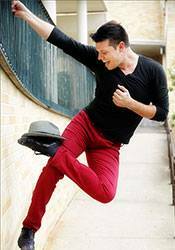 He has also performed at Carnegie Hall, at The White House and recently danced with Liza Minnelli for Rosie Live on NBC. Earlier this year, James choreographed an original new dance work for DANCE TRACKS NYC, set to Stephen Sondheim’s “Another Hundred People” (part of a three-part suite) inspired by a recording with an orchestration by Luther Henderson and conducted by Paul Gemignani, with the Royal Philharmonic Orchestra. The piece was performed with a hand selected group of seven dancers at Lincoln Center’s Clark Theater. The piece generated excitement and Dance Tracks Director Pamela Pardi asked James to continue fleshing out the piece and come back in April for another showcase at The Alvin Ailey Dance Theater. He expanded the piece to 12 dancers. That piece had a working title of “March” and also included the music of George Gershwin, which was the remainder of the three-part suite. The completed piece, again, generated a buzz, which brought an offer to put the piece onto the prestigious New Jersey Ballet, as part of their 50th Anniversary Season, debuted on May 2nd. In addition, James has been teaching at Broadway Dance Center and other NYC professional dance studios and is currently in preparatory stages, working with Tony Award Winner and Broadway legend Donna McKechnie, as her Associate Choreographer, to create dances and musical numbers for this summer’s production of Guys & Dolls at The Hollywood Bowl, directed by Richard Jay-Alexander, with Musical Director and Conductor Kevin Stites leading The Hollywood Bowl Orchestra. James Kinney, as choreographer, is featured in a new documentary film, entitled Thespians, directed by Warren Skeels. The film will be playing the Film Festival circuit in the upcoming season, while production company TigerLily Media looks for a distribution deal. You can also find him, routinely, teaching Master Classes and judging various National Competitions, when time allows, as well as performing in or helping to stage benefits for various causes, including BC/EFA, The Actor’s Fund and, recently, for ROSIE’S BROADWAY KIDS.